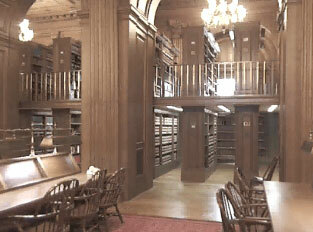 Photograph of the Reading Room of the Supreme Court Library. Copyright © Jerry Goldman. Used with permission. The Featured Collection for this issue of D-Lib Magazine is OYEZ: US Supreme Court Multimedia. OYEZ provides a wealth of information about the Supreme Court, but arguably its most valuable offering is access to the complete collection of audio files of Supreme Court cases from 1990 to date. OYEZ is an ongoing project that has as its mission "to create a complete and authoritative archive of Supreme Court audio covering the entire span from October 1955 through the most recent release." With major support from NSF's Information Technology Research initiative, investigators from diverse fields of computational linguistics, psychology, and political science will create a fully searchable archive of more than 6000 hours of Supreme Court audio. In addition, the project will create open-source tools to annotate the audio and to build collaborative commentaries based on the archives. For example, experts in the area of copyright can review all the copyright arguments of the last fifty years, selecting the portions of interest, and then annotating those sections. The annotations can then be shared with others, used for supporting or critiquing theoretical claims, and guiding others in subsequent searches. 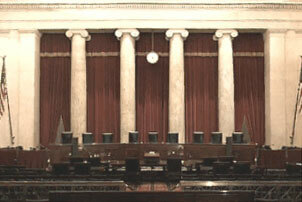 Photograph of the court room of the US Supreme Court in Washington, DC. Copyright © Jerry Goldman. Used with permission. The OYEZ site has been well designed with user-friendly navigation, clear description and flexible search capabilities. Resources are organized logically into categories such as: On this Day (a listing of past events searchable by date); Justices (links to information about each of the Supreme Court Justices, including the justice's background, biography, cases heard, etc. ); Cases (a listing arranged by subject with links to particular cases where one can find the facts of the case, question presented, and conclusion); Tour (a behind the scenes tour of the Supreme Court building and groundsviewable using QuickTime software); Discussions (which leads to an external web site for those who wish to join discussion groups related to Supreme Court cases); Yahoo! (a link that leads to the Yahoo! directory of Supreme Court related web sites); Appellate.net (a listing of docket reports from Appellate.net); On the Docket (a Northwestern University journalism web site, edited by Jack Doppelt, that is continuously update with news , articles, and other features about pending Supreme Court cases; and Recent News (links from the OYEZ site to recent news items about the Court from various sources). In addition, the site provides an FAQ, a page of answers to frequently asked questions, the first of which provides the definition of the web site's name. "Oyez" means "Hear Ye", and the Marshall of the Court calls it out three times to bring the Court to order at the beginning of a session. Be sure to check the Features page, too, for information about new resources and features as they are added over time. Information about RSS feeds is just one of the features OYEZ offers that are accessible from the Features web page. 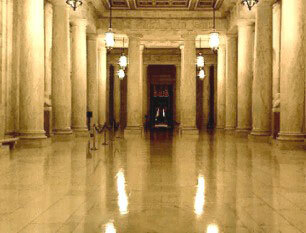 Photograph of the Great Hall of the US Supreme Court. Copyright © Jerry Goldman. Used with permission. One of the more unique offerings at the OYEZ site is a quiz game called OYEZ Baseball. First you select a particular justice's name from the list provided at <http://www.oyez.org/oyez/portlet/justices/>, then select the link "Baseball" on the left side of the page, and you will be asked a multiple choice question about that justice. Both the questions and answers are based on the game of baseball. This is most fitting because the idea for creation of what eventually became the OYEZ web site was hatched at a Chicago Cubs baseball game. Hard-core baseball or Supreme Court fans can also access a front-end version of OYEZ baseball. The URL for the OYEZ web site is <http://www.oyez.org>.